Day 373 - So Long, February! Hasta La Pasta! Kiss February goodbye because MARCH is almost here! I did put my 'spring wreath' on the front door and took down my winter one. Do you know what I do now with my plethora of wreaths that I hang up at various seasons? I hang them on hangers and put them in our spare coat closet where I keep the Christmas decorations. They take up too much room to find wreath boxes and places to put the wreath boxes. They do just fine hanging in the closet and don't get crushed that way. Heloise, are you listening??? 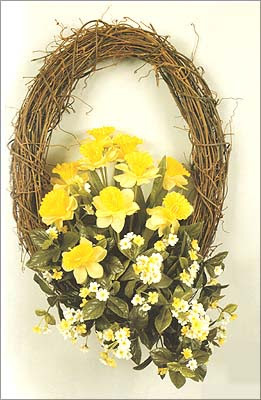 This photo isn't my wreath, but I cut up a spray of fake daffodils and arranged them around the border of my wreath, among the ivy that was already on it. It looks very springy now. I still have assorted winter stuff to take off the walls, but what will I hang there instead? Guess I need to BUY some new spring stuff for the walls. Oh gee - there's a CRAFT FAIR AT THE FRANKLIN REC CENTER THIS SATURDAY - GET THERE EARLY BEFORE I BUY ALL THE GOOD STUFF. Or...don't. Clerk: Wanna try some grapefruit or some strawberry shortcake? Me: Better go for the diet food. What kind is this? Pink grapefruit? Me: It looks pink, not white. Clerk: Looks white to me, let me look on the package. Oh, it's red grapefruit. Me: It's not red, it's pink. Me: The package says red, but it's pink grapefruit. So... what did I do? I bought some anyway. It was pretty sweet, it was on sale, and the package says red, but it's PINK. So there! Charlie has a froggy throat this morning, hope he's not getting that sore-throat-flu that's going around. It's supposed to be 68 degrees this afternoon, NOW you're talkin' nice weather! OOps - it's after 6:00 already so I'd better run. TTFN! Day 372 - Two-fer Tuesday - Mooooo! Greetings, Bloggy Twins and other double-troublers! You know your eyesight is going when you start thinking you're seeing bizarre stuff, but it's just because you didn't SEE it correctly. 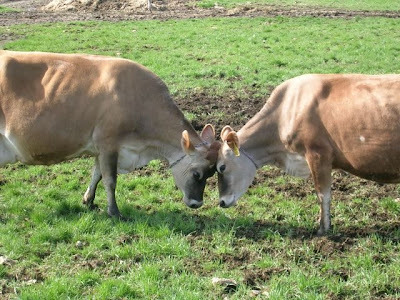 My two-fer story of the day is about two cows - very similar to these two you see here, except all black. These two cows are stuck together by getting tangled in a rope. Well, I'm running late already this morning, so I'd better make this short and get a 'mooo've on. It's Rise and Shine and 'Put your best foot forward' Day! 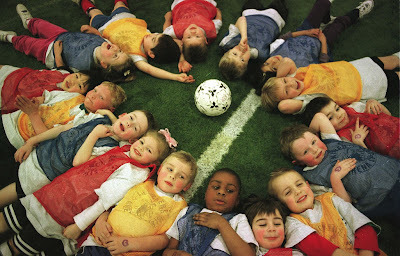 Don't you LOVE this picture? The internet makes it so easy to find 'art' to go with 'da blog'. The point is, Monday is here. The point is, the weekend is OVER and we want more weekend! We didn't go to a movie after all - Charlie, Joe and I went to Jonathans sports bar instead. A better choice! I had a scrumptious spinach and shrimp quesedilla that probably had a million calories worth of cheese in it. DEEELICIOUS! Charlie and I didn't do our taxes. I started my vacuuming but only did a couple rooms. I did three loads of wash. I never washed the kitchen floor, just vacuumed it. Well, maybe I'll accomplish more at work than I have at home the past couple of days. That would make me happy as well. Guess I'd better get to it! Have a great START to the work week, only 4 more days to go after today! TTFN! Sorry for the late posting, Charlie and I have been up for hours, had breakfast, and made a Wal-mart run already this morning. I've also got the wash going (actually drying). 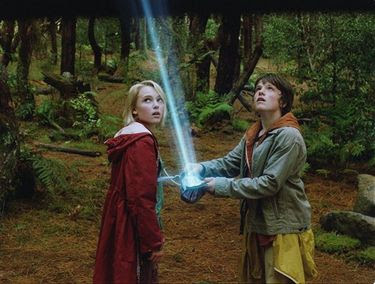 We're going to see 'Bridge to Terabithia' a little later, and we're meeting Buddy Joe at the theater. Maybe we can talk him into a little outing after the movie too. Changing subjects - the price of gas has gone up 20 cents a gallon in just the last couple of weeks. I don't like it, and since I can't do anything about it, I can complain to the blog. Changing subjects - the daffodils are coming into bloom here - can you believe it? I guess it's time to take down the 'winter' wreath from the front door and replace it with a 'spring' wreath. I also have all kinds of assorted snowmen and snowflakes and such scattered around the house. I did take out my spring pillows for the guest room already, that got me started! Well, if you'll excuse me, I'm going to go take that wreath off the front door and put the other one out! Day 369 - Saturday! Breakfast, anyone? This morning, we feature another fine example of Charlie's breakfast merrymaking! Homemade pancakes with butter, country ham and two fried eggs. The syrup missed the photo. By the way - Charlie's doctor just reminded him to cut back on the cholesterol and sodium - but I don't know if that counts on the weekend! What do YOU eat for breakfast on the weekend? That's not what I have for breakfast, by the way. I have a much more calorie-friendly breakfast, even on the weekend - like Thomas's 100 calorie english muffins with an egg on it, or something like that! I do have 'loaded scrambled eggs' when Charlie does though! They have VEGETABLES in them! The good news - I saw someone at the pool who I hadn't seen in a year or more (since I got laid off, come to think of it). Anyway, it was nice to see someone who used to be a 'pool buddy', and he even remembered my name - I didn't remember his (shame on me). The funny part - his name is 'Vince'- and I should have remembered it because in my mind I always call him 'Vinz Clortho - Keymaster of Gozar' from Ghostbusters. No, I never told HIM that! He's just the only person I know with that name. Well, that's it for now, unless I feel like writing more later. I have a big day of shopping and swimming planned. It may rain later, so maybe I'll beat the rain back home! Day 368 - Friday, Lovely Friday! It's the last day of the work week, and the last Friday in February. Celebrate by marching in a circle, chanting 'Fri-day, Fri-day, Fri-day!' 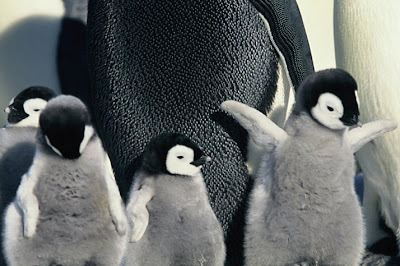 If you're a penguin, you can do it too. It has finally warmed up this week in Nashville to something approaching springtime loveliness. We had one day that hit 70 -that was perfect. Now our afternoons have been in the 50's for a couple of days. That is tolerable, but I'm ready for 70's again. Do you ever wake up in the night and check out the time? If I wake up and it's 2:22 or 3:33, for some reason it is 'better' than if I wake up in the night and it ISN'T some kind of cool clock time. Why on earth should I care? I don't know - I just DO. No big plans on the horizon for the weekend - Publix has Edy's ice cream on sale Buy-1-get-1, I have to go get some, that's my favorite. MAYBE I will get my taxes done. I surely hope so. The government doesn't need to hang on to MY MOOLA one day longer than necessary. MAYBE I will get the kitchen floor washed, I will tell myself I am exercising and to LIKE IT. That's all for now, folks!! Have a great Friday and a great Weekend! TTFN! Day 367 - Do you remember Hollywood Squares? 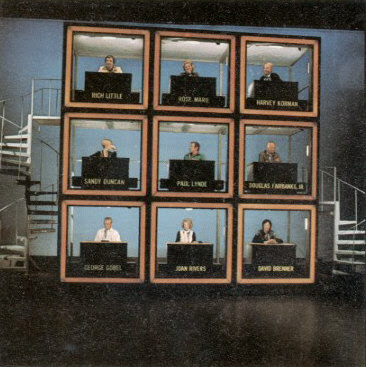 Do you remember the Hollywood Squares game show? Stars would sit within an oversized tic-tac-toe set and answer questions, sometimes in a hilarious way. My aunt sent me an email with some of the 'best of', and for today's blog I'm going to list them here. Believe me, it'll take just as long for me to format this as it would have to write something from scratch! A. Rose Marie: You ask me one more "growing old" question Peter, and I'll give you a gesture you' ll never forget. Have a great Thursday! Don't miss Survivor tonight! TTFN! Day 366 - It's the Bloggy New Year! 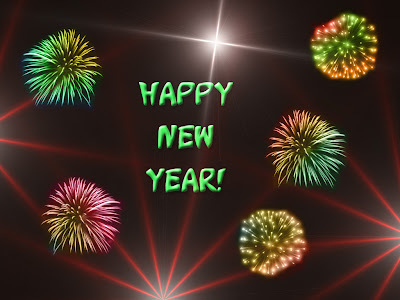 Yes, I know it's not really the New Year, but it is for 'da blog'. So - should I continue with my posting the number of days each time, or ditch that, since it's been a year? I don't mind keeping up with the days if that isn't annoying anyone. This is going to be short because I'm running late this morning. I almost forgot to download a dozen photos from my camera that I needed for work. Why would I need my digital camera at work? Because we don't have printable white boards, that's why. We brainstorm all kinds of cool things on the white board, and then take a photo of it for the tech writer to turn into pictorials. Not a bad idea, eh? How innovative, Karen! Anyhow - time for me to get ready for work and hit the road - have a Happy New Year and I hope you didn't party too much yesterday! (just kidding, no party). Day 365 - Fat Tuesday and Two-fer Birthdays! What a day for a celebration! All of New Orleans is joining us, except they call it 'Fat Tuesday'. Well, I made it! One year ago today I got laid off at work, and shortly thereafter started the blog, back-posting entries to make it one year. 361 postings (365 days) later, here we are! Happy Birthday to 'da Blog', Happy Birthday to 'da blog'. 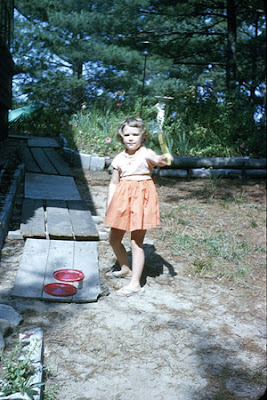 It is also my daughter Heather's birthday today - Happy Birthday, Heather! With the holiday yesterday, I don't know if her card arrived yet, but it'll get there today at the latest. What are the odds of getting laid off on your daughter's birthday? If anyone had asked me a year ago if I would be writing a blog nearly every day for an entire year, I would have said 'no way'! The things I do for my fans... or as Buddy Joe would say 'Oh good, now you have something to obsess over'. Thanks, Joe. Uh, with friends like this, who needs enemies, right? Have a wonderful Birthday, Heather! And everyone else - party on, dudes and dudettes! 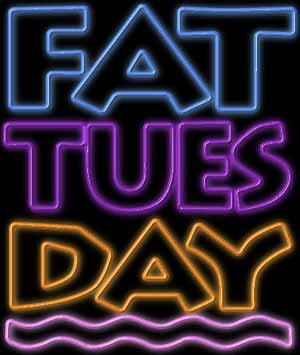 Celebrate Fat Tuesday and the Bloggy Birthday! Have you been reading the blog for just about a year now? Yes, it's the Blog's anniversary eve (with a commemorative mug to celebrate the occasion), the anniversary eve of my layoff, and tomorrow also is Heather's birthday. I'll never forget the date, that's for sure! I haven't done my taxes. I haven't rolled over my 401K. I haven't closed my old bank account. We watched the Daytona 500 yesterday - very interesting finish to the race, wasn't it? 'That there yeller car whipped up on 'em at the last minnit'. We watched 'The Amazing Race All-Star' premiere - we felt sorry for the team who got eliminated, we had liked them. We watched 'The Apprentice' - and didn't feel sorry for the girl who got eliminated. It's supposed to start warming up this week, FINALLY. It is 17 degrees now, but by next weekend we may hit SEVENTY. Now you're talkin' - get that outdoor pool ready for me! 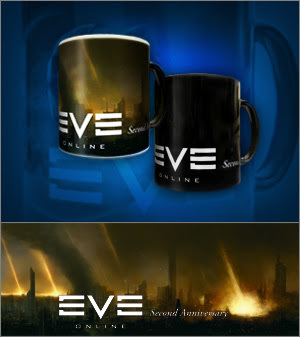 Have a nice Anniversary Eve and Birthday Eve. Get ready to celebrate tomorrow! Day 363 - Sunday is here and Monday is next! It's Sunday and a new work week begins tomorrow. My latest favorite church sign - 'Sign broken, the message is inside'. Very smart! Cajun food at Papa Boudreaux's was excellent as always! We were the first ones in there when they opened at 4. 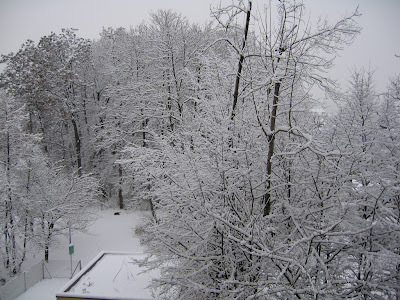 It snowed lightly all day yesterday with very little accumulation. However, after we were home again safe and sound I heard that things iced up, and there were 50 accidents around Nashville due to icy roads. Glad we missed that! Charlie and I had seafood gumbo, and our friends had chicken and andouille sausage or shrimp and andouille sausage over linguini - those also looked outstanding. We had vanilla ice cream with whipped cream for dessert, and we brought wine and beer with us (it is BYOB). Our bill with tip came to a mere $40. Awesome! Well, gotta go read the Sunday paper - have a great Sunday and do your taxes! (No, I haven't done mine yet). Update at 8:32 - I feel like I've been up for hours and it's only 8:30. Sheesh. Don't forget that the Daytona 500 is on this afternoon, and the Amazing Race starts up again tonight! I am not crazy about the 'Amazing Race All-star' theme this time because most of the 'All-stars' annoy me. However, we'll probably watch it anyway. TTFN again! Day 362 - Day-zed And Confused No More! It is now Day 362 like it's supposed to be. I've changed the 'Errors in my Days' by going back to older postings and finding where my day count got messed up. I have edited each and every entry since then to correct my Blog titles. That's my punishment for making the mistake in the first place. Happy Birthday to my sister today! I won't say which one, but I could since she is YOUNGER than I am! I hope her birthday card arrived on time. It's snowing here (again) today and we're supposed to go for Cajun this afternoon. I'm still keeping my fingers crossed that the roads will be fine and the snow will just accumulate on the grass. Have a great Saturday, everyone and a nice weekend! TTFN! Day 361 - It's FRIDAY - That ROCKS! March in a circle, chanting 'Fri-day, Fri-day, Fri-day, Fri-day'. Repeat periodically until Friday at 5pm when you can really start enjoying the weekend. OMIGOSH - I added this picture after I'd written some text and it didn't double space all my lines. Thank heavens for small favors. Maybe I can motivate myself to swim tonight, tomorrow and Sunday. Big dinner tomorrow at Papa Boudreaux's Cajun Cafe with TY and SY! YUMBO the GUMBO. I could eat that stuff every single day. (Do you notice that SOUP seems to be a favorite? If I'm not talking about wonton soup I am talking about Gumbo. Maybe it's a winter craving). This is really our Valentine dinner out. I love to go out to dinner, but I don't love to go out to dinner when everyone else in the world is also trying to get a table. Not fun. The only worry is that we are expecting snow tomorrow, I just don't know exactly when or how much. Hey - you know what I just noticed? It's the one year anniversary of my blog on the 20th (and Heather's birthday). That means my 'day' count that I write on each posting should be nearing 365. I totally screwed that up somehow! Oops. That means 'Do it yourself-ers'. Charlie had a little incident this past weekend with some gorilla glue (which is one of those products that nothing can remove) and the handle of a brush mower. Maybe a little dirt and grime were involved too. Anyhow - to make a long story short Charlie has semi-permanently (until the skin sheds and new skin grows back) bonded some coarse brown 'nasty stuff' onto his fingers. Oops. Charlie and gorilla glue have a history together. For example, there is still a spot of gorilla glue on the kitchen counter from a cutting board repair job that went a tad awry. Oops. It'll be there forever as a gentle reminder. At least skin regenerates. Beware, DIY-ers out there - products that say 'PERMANENT BOND' mean it. Right on their website they have a 'firstaid' link for all the people who bond gorilla glue to themselves... Wonder why they need that?? Have a great day, readers, and BE CAREFUL!! Day 359 - Happy Valentines Day! Greetings, Bloggy Lovers or Wanna-Be's Everywhere! Happy Valentines Day! 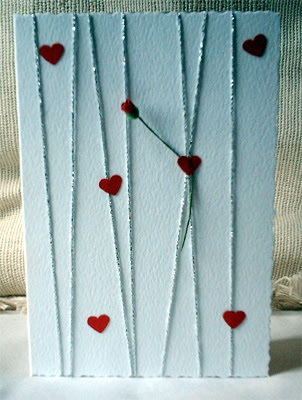 This card is entitled 'Hearts on a String' - isn't that cute? Charlie and I have already exchanged cards and gifts, and we're going out for our Valentines dinner on Saturday BACK TO THE CAJUN PLACE YET AGAIN for seafood gumbo. I am addicted, I admit it. I have a bag of canned goods for a food bank collection at work today. We are allowed to wear our company t-shirts to work today if we bring a canned item. I need to go take a peek at the brownies. Hold on. I set the timer for another 5 minutes. I am no brownie expert, so I hope they come out OK. I miss the homemade valentines cards the kids used to make for me at school - aren't they the most precious things? Have a wonderful Valentines Day, everyone! TTFN! Day 358 - Missed it! Charlie had fixed our internet connection when I got home this evening - thanks, Charlie! I don't know why it was messed up, but he took everything apart and put it back together again, and things are working now. Must've been a cyber-hiccup. Day 357 - Still Digesting the Weekend? Ha! That's a good one - blah-ggers! I've still got it, I just don't know where I put it! Well, other than being only mildly funny this morning - I am sharing with you the photo of Charlie's country breakfast yesterday. He made this breakfast himself while I was off swimming yesterday morning. Contents - 2 medium fried eggs on top of a large pool of biscuits and gravy (gravy meaning southern style cream gravy) and two big slabs of fried country ham on the side. YUM-O. Heart attack on a plate, but delicious! Gee - somehow my hand-held breakfast sandwich that I ate on the road doesn't compare - taste wise or calorically. Weekend in review - Looks like I did about half of what I had hoped to. That's OK with me. Did I do my taxes? Nope. Did I get the wash done? Yep. Did I wash the kitchen floor? Nope. TTFN and have a nice Monday!!! If you haven't shopped for Valentines yet - hurry up! Day 356 - Spring is Almost Here! Charlie and I drove by a field yesterday where a VERY newborn calf (still had the cord attached) was having its first 'drink of life' from mother cow. It was smaller than the one in this photo, and solid black. VERY sweet. I'm not going to blog for long this morning, I'm going to go swim even though it's only 15 degrees. I'm going to the WARM pool this morning, it's worth a 40 mile drive. Maybe I'll get there before the Starbucks coffee runs out! I'll also take a breakfast sandwich with me to eat on the road, and a green tea to rehydrate with after I swim. Have I mentioned I'm addicted to green tea? I drink the bottled diet Lipton green tea at home, and I drink hot Bigelow green tea which is free where I work. I have not had a cold all this winter, so maybe it helped! Greetings, Bloggy Weekenders! What are YOU doing this weekend? I'm on my second load of wash, and there'll be a third. Wash, wash, wash. Charlie and I had loaded scrambled eggs (with salsa on top) and bacon for breakfast, with lots of coffee. YUM-O. The washer AND the dishwasher are making music in the kitchen. Swish swish swish. We may go to the movies this afternoon - it's only in the 20's here and there isn't much we can do in the cold outdoors! Charlie is outside right now, but I don't think he'll be there long. Have a great weekend everyone - if there's something to tell, I'll write more later! Day 354 - FRIDAY, FRIDAY, FRIDAY! It's Friday, and it's time to march in a circle, chanting 'Fri-day, Fri-day, Fri-day, Fri-day'! Today is the last day for yet another person at my work - we took him out for lunch yesterday at 'Fat Mo's Hamburger' joint. Fat Mo's is famous for gigantic and delicious burgers, but I get their gyro, which is also very good. You can order a TWENTY-SEVEN OUNCE BURGER there if you want to. I don't want to. Here's the website if you want to peruse the menu. I had a gyro and a chocolate shake. YUM. I'm really surprised that today is Friday - this week flew by, I must have been busy! Goal for the weekend - DO MY TAX RETURN, DO MY TAX RETURN, DO MY TAX RETURN. Charlie is mailing a stack of Valentines for me this morning, it's less than one week away! TTFN and have a great Friday and a great weekend, everyone. Day 353 - A New Season of Surivor-age! Greetings, Bloggy 'Misspellers of Fiji'. I think I might have spelled it Figi once. Oops. Do you ever wish you could GO to some of these places? I do - as a valued GUEST or TOURIST. Everything you ever wanted to know about the 'Cannibal Isles', as Fiji is really 322 islands, only 100+ of them inhabited. I'm already running out of time today - gotta go! Have a fun Thursday and GO SURVIVOR! We are having BBQ and Chili tonight instead of pizza, I'm going to mix the two and stuff them in baked potatoes with cheese and sour cream. Sound yummy? Oh, yes. Greetings, O Thou Most Bloggy! Hey - that sounds like it could have been said in the MIDDLE ages! We're in MIDDLE Tennessee and it's the MIDDLE of the Week! How are you? Fair to MIDDLIN'? This 'MIDDLE School Girl' brain looks an awful lot like MY brain - please note the exceptionally large shopping area. Is that anything to celebrate? Probably not. Ok, Ok, enough - I give! I had a nice swim last night - the water at the Rec Center seemed a little warmer than usual - thank heavens. The water aerobics class they have on Tuesdays and Thursdays was in full swing when I left - I may join it sometime - their leader appears fun and full of energy. 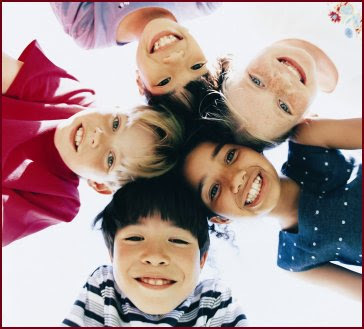 We have a mid-day company function today at a local hotel - the question is - will they have FOOD? 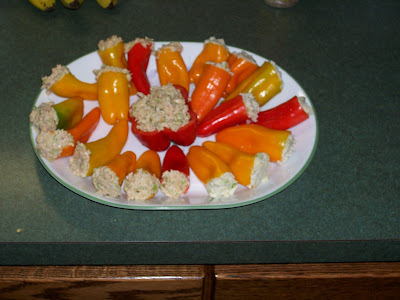 Here is a picture of the stuffed mini-peppers I made for the Superbowl. Thanks, Charlie for the photo! The ones on the right-hand side of the dish are crab salad, and on the left side are salmon salad (slightly different stuff in them). If you have never tried these baby sweet peppers, they are just outstanding - delicious and very low calorie which is hard to find in a food! I have some in my lunch bag right now to snack on - they are that good! Even 'da guys' at work will snack on them if I put some out after going to Sams club - everyone's on a diet these days. So.... What's happenin'? Idol tonight, I assume. Swimming tonight - I didn't swim last night or go to Cracker Barrel, I am such a slacker! Slacker slacker slacker slacker! I am grilling chicken for supper, and yesterday I mashed together a boiled turnip, parsnips and baby carrots for a tri-color-root-vegetable side dish that is actually not bad! I have some of that left over for tonight. Charlie didn't say much about it but he did consume it - I think he said it was 'interesting'. Southerners don't eat boiled turnip much. Anyhow - it's time for me to 'Shovel off to Buffalo' - why hasn't anyone thought of that? You shuffle off to Buffalo in the summer, and Shovel off to Buffalo in the winter! Wahoo! No, I'm not a big sports fan, but Tennesseans are happy today! Why? Because former Vols Quarterback Peyton Manning (now of the Colts but we won't hold that against him) and his team won the Superbowl last night after a bad start and monsoon rain! Congratulations to Peyton and the Colts! Thank you thank you to TY and SY for being the host and hostess with the mostest. We had veggies and dip, seafood stuffed mini-peppers (I brought those), sausage, cheese and crackers, egg rolls, sandwiches, and jambalaya with rice! Oh - and don't forget fudge pops for dessert! And don't forget beer and hot, mulled wine. I can't move today. 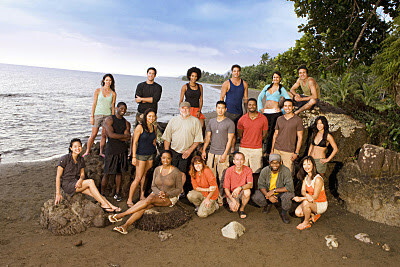 Newsflash - Survivor Fiji starts Thursday night - set your VCR, Nancy! Have a good Monday (if that is possible). No Cracker Barrel for us tonight so I can go swim off a few of these calories! TTFN! Day 349 - Superbowl Sunday! It's Superbowl Sunday, and Charlie, Joe and I just finished breakfast (fruit salad and breakfast sandwiches). Joe went with us yesterday afternoon to Papa Boudreaux's Cajun Cafe, then stayed over last night. It's about 30 miles from our house and worth the drive. We got there promptly at 4pm when they open, along with all the senior citizens that eat dinner at 4 every day. ;-) (Just kidding, you seniors out there - don't get upset, it's only a blog). 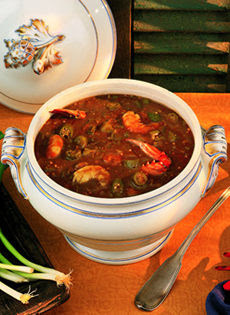 I had the most OUTSTANDING Seafood Gumbo - a gigantic bowl of gumbo with big, tender shrimp, crawfish, some kind of other fish, onion, okra, and rice. Absolutely unbelievable. We all shared a bowl of red beans and rice for an appetizer, and it was great too. I've gotta go swim off my gumbo, so maybe I'll have time to blog more later. I might not, though, so don't count on it! TTFN and have a great Superbowl! 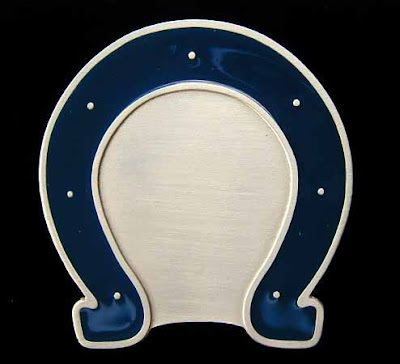 It's Superbowl Eve and we'll be rooting for Peyton Manning and the Colts tomorrow. This morning I'm going to the half-price sale at Goodwill in Lewisburg, TN. This afternoon Charlie, Buddy Joe and I are going back to the Cajun place I wrote about a couple weeks ago to get more gumbo and red beans n rice. Can't wait. There go the diet plans. This week I swam Monday night, Tuesday night, Thursday night and Friday night. It's not enough considering the calories I am consuming at the moment. Girl, get your hand OUT of the jar of peanuts! Girl, don't eat those Fritos, they're bad for you! Girl, chocolate shakes are for THIN people, not YOU! Let's review the food-related events in the coming week, shall we? Cajun food today with wine. Superbowl feast tomorrow with beer. Company function Tuesday - food selections unknown. Girl, you'd better swim like your life depends on it! Get in that pool, girl! TTFN! By the way - trying on clothes burns calories! Day 347 - Friday is HERE and the SNOW is HERE! We actually did get snow last night! Good grief - the news and weather forecasters went on and on about yesterday's snow non-event, and then didn't mention we'd have a significant snow overnight last night! It's supposed to snow till the late morning here. If the roads are OK I'll go into work, if they're not I'll work from home. Charlie's back - he says it's snowing hard but the road is just wet, that sounds good. AND the paper was here, which means the paper carrier made it OK.
Ahhh - Friday of Superbowl Weekend. I am SOOOO ready for Friday, and I might be ready to do my taxes this weekend! I need to double check that I've received all the statements I need, but I think I have. I'll make this quick because I might need to leave early. TTFN and have a good weekend! So long January and HELLO income tax filing and income tax refunds! Well, our big snow event last night was a bust, we got nothing but a dusting. Charlie calls it a 'heavy frost'. The schools here are closed anyway. 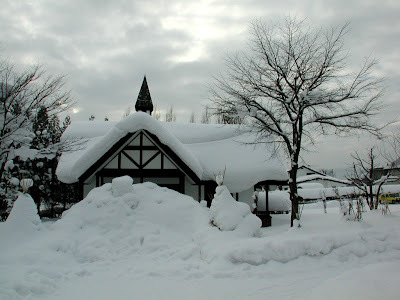 This photo of snow is from JAPAN of all places, that's probably where we'd have to go to get some 'real' snow. However, it's Thursday, and that means tomorrow is FRIDAY and that's a good thing! Temps are supposed to stay in the 30's for a while. I can stand it because by the end of February (here in the south), the daffodils will be up and spring will be well on the way. Can't wait! Hey! 19 more days till the anniversary of my layoff and my BLOG's BIRTHDAY - same day as my daughter's birthday. That's a milestone for me, of course. TTFN and be careful in the snow, whether there is a little or a lot!